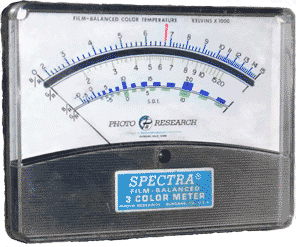 Color temperature meter used by professional cinematographers. The color temperature scale, the topmost one, reads in thousands of kelvin. A measure of the distribution of power in the spectrum of white, or colorless, light, stated in terms of the kelvin temperature scale. The human visual system is incredibly adept at quickly correcting for changes in the color temperature of light; many different kinds of light all seem “white” to us. Photographic film is not so forgiving; daylight film is made to be exposed by 5500 K light, while “indoor” film requires light with a color temperature of 3400 K (or 3200 K, for professional film). Photographs taken indoors under incandescent light on ordinary daylight film will come out orange. Photographs on indoor film taken in sunlight will be blue, as will photographs taken outdoors in shade illuminated by blue sky. To understand why a characteristic of light can be described by temperature, imagine a clear incandescent lamp connected to a dimmer. As the dimmer is turned up, the voltage increases and the lamp's filament becomes warmer and warmer until it begins to glow cherry red. As the voltage continues to increase the filament gets hotter and hotter, glows more and more brightly, and is less and less red. The nature of the light is changing with the temperature of the filament. To formulate mathematical descriptions of the relationship between the temperature of the filament and the light being emitted, physicists use the concept of a blackbody, an imaginary perfect emitter and absorber of radiation. Most light sources emit light that is a mixture of light with different avelengths, although some wavelengths are missing from certain kinds of light sources, such as fluorescents. The light from a blackbody, however, is a mixture of light with a continuous range of wavelengths. The light is strongest at some particular wavelength. On each side of this peak, the amount of power gets progressively smaller. The farther a wavelength is from the peak, the less power the light with that wavelength will have. As a blackbody gets hotter, the peak shifts toward shorter wavelengths. At this point you should stop reading and play around with one of the excellent interactive diagrams which show the change in the spectrum of the emitted radiation as you vary the temperature. See Resources, below. An incandescent lamp is very nearly a blackbody radiator, and the distribution of power in the wavelengths it produces can be described by the temperature of a blackbody radiator whose light would appear to the human eye to be of the same color. So a typical 100-watt incandescent has a color temperature of 2870 K. Photoflood lights, however, are either 3200 K or 3400 K.
With light sources like fluorescents the situation is more complicated, because power-against-wavelength graph for their light would show many sharp peaks, not just one smooth curve. It does not resemble blackbody radiation. However, a measure called correlated color temperature is assigned to such light sources by visually matching their light with light from a blackbody source. See CRI. * Photographers—beware of assuming that fluorescent lights rated at 3400 K are a good match to color film balanced for 3400 K photofloods, or that daylight fluorescents (6300 K) match daylight color film. See CRI, and consult the filtration recommendations of the manufacturer of the film. https://demonstrations.wolfram.com/BlackbodySpectrum/ It requires either Mathematica or the free Mathematica Player. Another nice interactive diagram illustrating color temperature is at https://webphysics.davidson.edu/Applets/BlackBody/BlackBody.html It requires Java (at least version 1.1). Last revised: 1 December 2010.